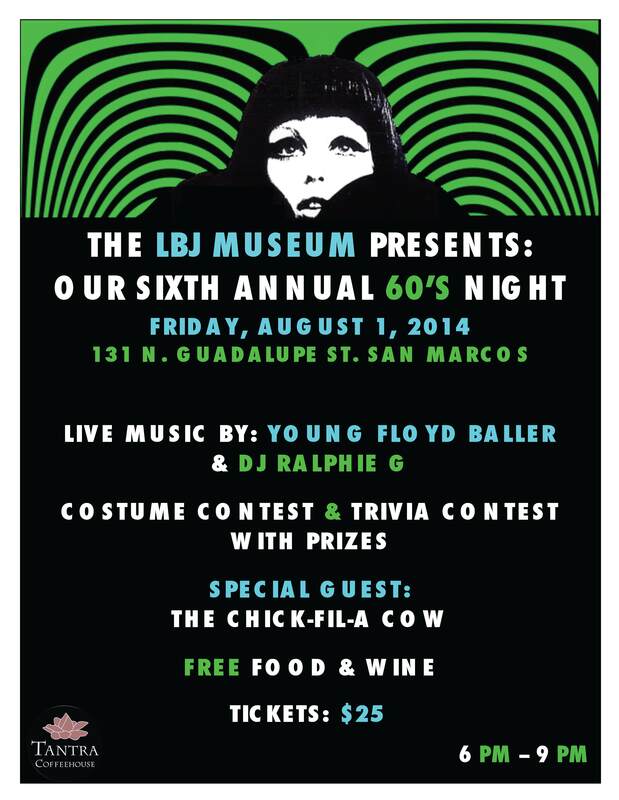 SAN MARCOS – The LBJ Museum of San Marcos welcomes the public to the 6th annual 60’s Night Fundraiser Friday, August 1st from 6 p.m. to 9 p.m. to celebrate the colorful decade of the sixties and President Lyndon B. Johnson. Join us for a night filled with psychedelic singles performed by Young Floyd Baller and played by Museum Manager, DJ Ralphie G. Including a 60’s themed trivia contest and a costume contest for prizes. 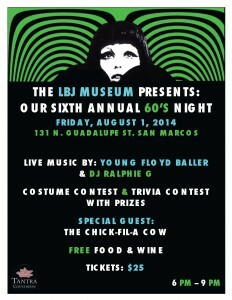 Not to mention, the museum’s special guest: the Chick-fil-A cow will be there to “get jiggy with it.” The museum encourages attendees to come hungry for the food and wine provided by local restaurants. Marcos from Thursday to Saturday between 10 a.m. and 5 p.m. every week until the night of the fundraiser, but are encouraged to buy their tickets early. 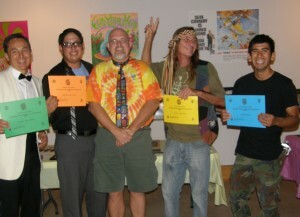 For more information, please contact the LBJ Museum of San Marcos at (512) 353-3300 or email the museum at: Director@lbjmuseum.com.